This is the updated version with a few additions and corrections based on both comments and new features added by Microsoft since my first post. 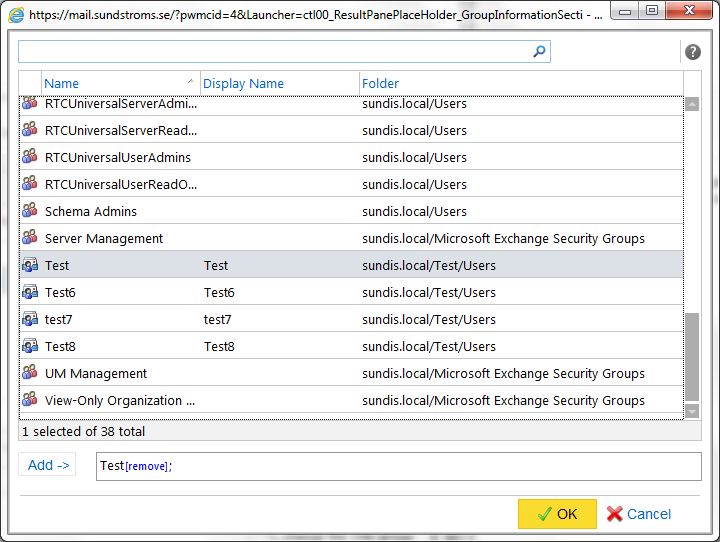 Note: the User parameter can in fact be either users or groups, the parameter name “User” is a bit misleading! 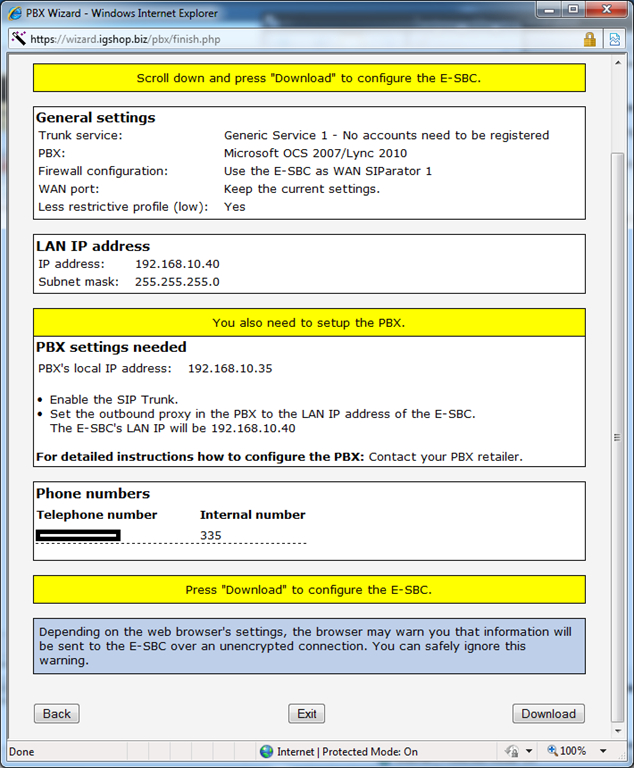 Note: In the screenshot below I received a message saying that Administrator already have access to the mailbox Test (Yellow text message). 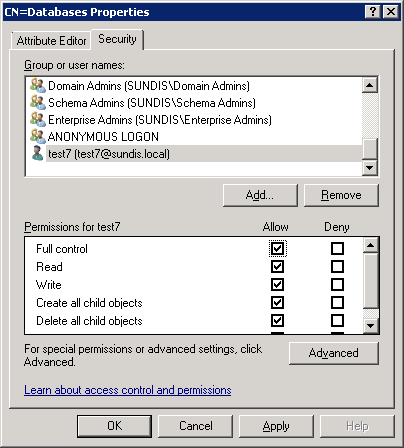 This can be done using one of three methods, you can add permissions using EMS or ADSIEdit. 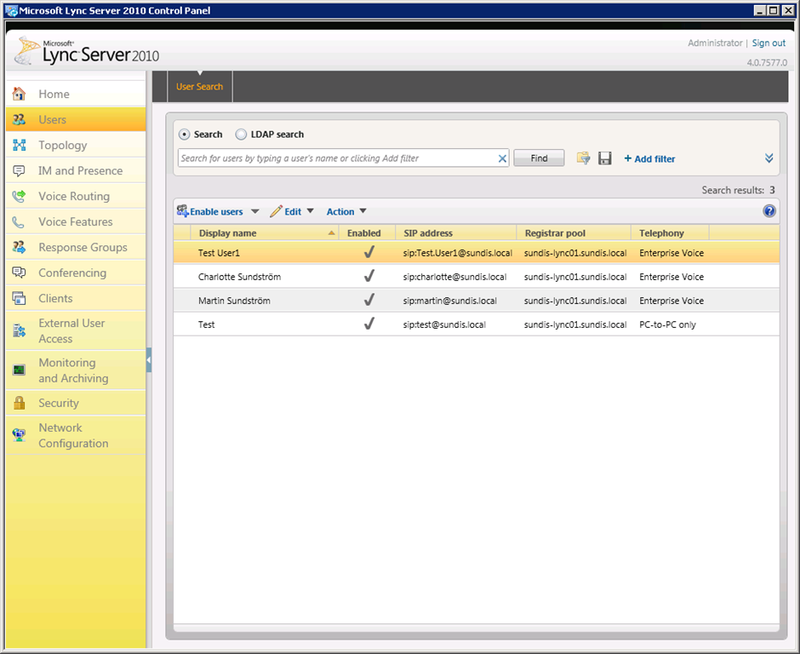 Granting Receive As and Send As permission to a mailbox database, the user can log on to all mailboxes within that database, and send mail from those mailboxes. 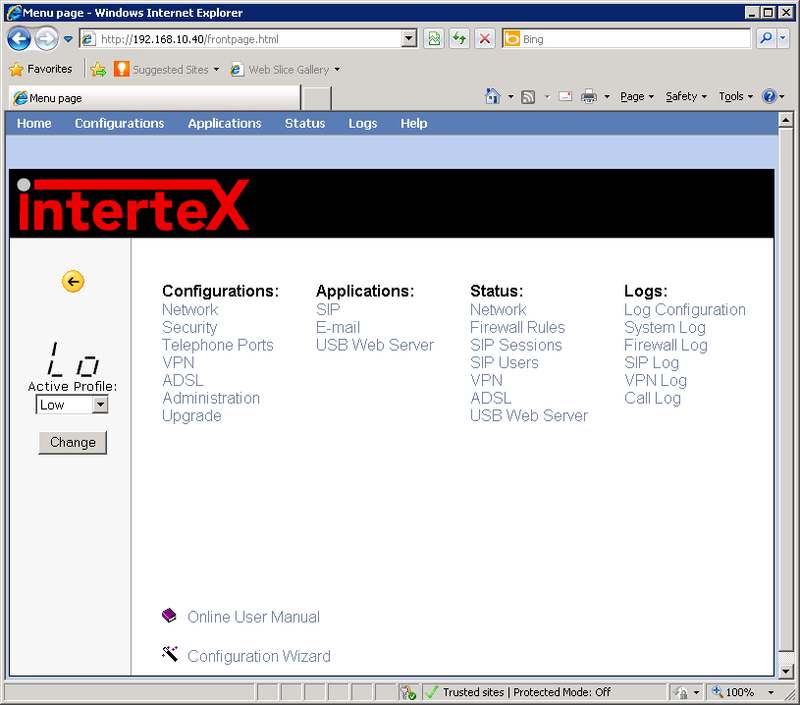 Open ADSIEdit, Right click ADSIEdit and choose Connect to. 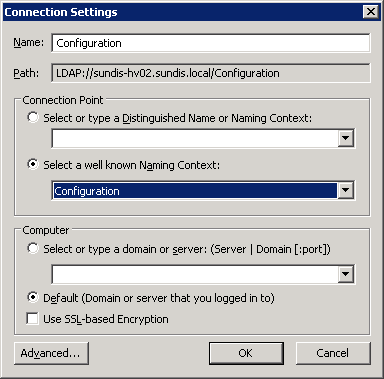 Select the Configuration Naming Context and click Ok.
Navigate to Configuration/Services/Microsoft Exchange/<OrganisationName>/Administrative Groups/Exchange Administrative Group (FYDIBOHF23SPDLT). 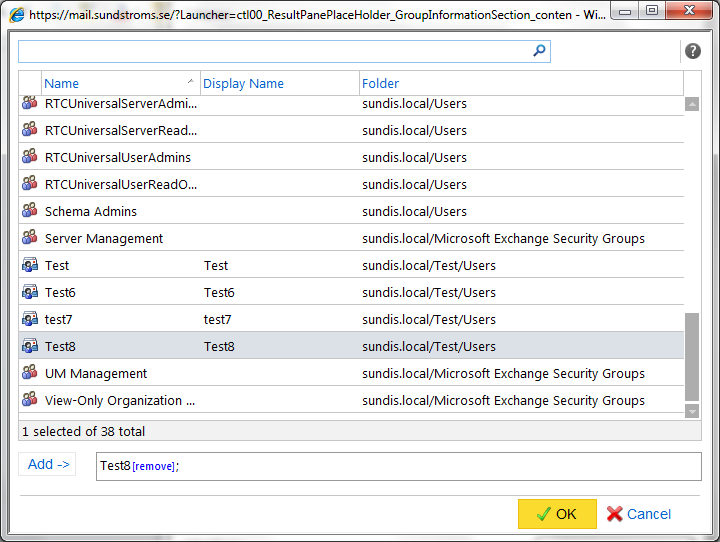 Right Click the Databases folder and choose Properties. Click on the Security tab and click Add. Enter the users or groups that you want to add and then click Ok.
Make sure that the added users or groups is selected, check the Allow box for Full control for each user or group, then click Ok to close the window and now we are finished with ADSIEdit. This adds permissions to all databases. 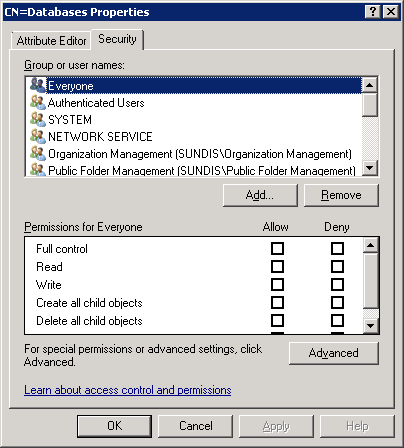 If you want to edit the permissions for a specific database you can open the Databases folder and open Properties for the database you want to configure. 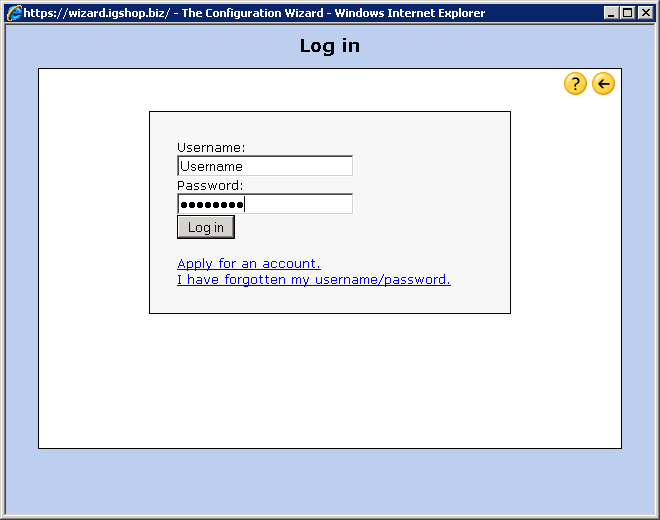 A final note: Full Access or Receive As permissions are granted next time the Microsoft Exchange Information Store service caches the permissions and updates the cache. 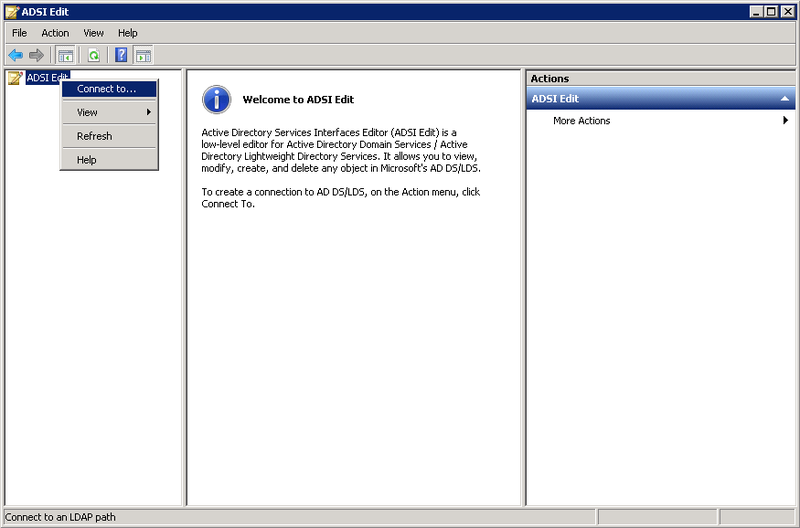 To grant the permissions immediately, stop and then restart the Microsoft Exchange Information Store service. Thanks for reading, I hope that you found it useful and please let me know if you have any questions! I am sorry to realize that It has been ages since my last post. There has just been a lot of other things that needed my attention. 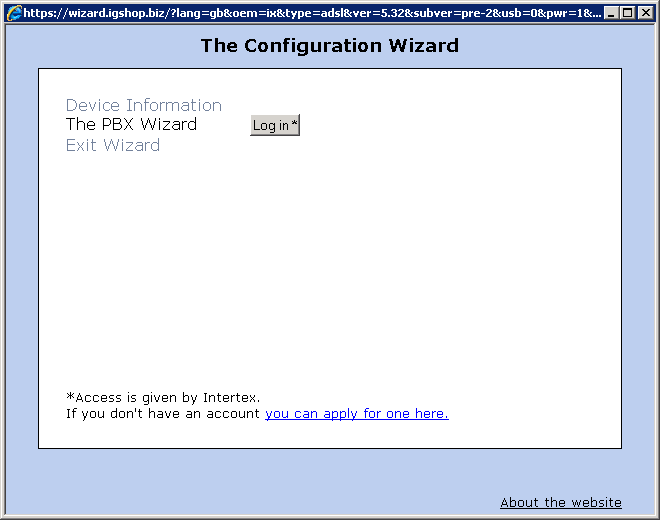 But now I am back and I will start with this last post in my series of posts about Role Based Access Control. In this post I will focus on different examples. If you have another example you would presented here please let me know. And if you find an error of any sort or have any questions or thoughts about it please do not hesitate to drop a comment or contact me. We will start with a simple scenario where we want to add two users to different role groups, Help Desk and Organization Management. We will use both ECP and EMS and we will start with EMS. 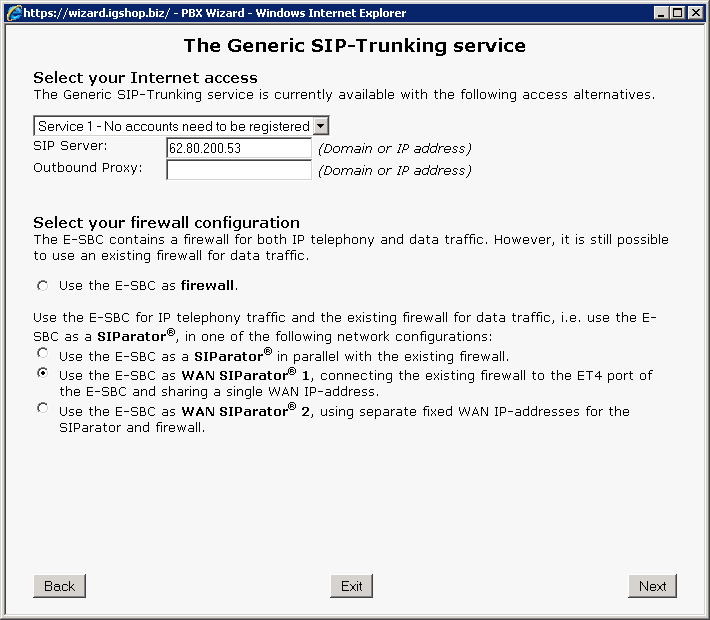 Using the ECP involves several more steps then using the EMS one-liner. 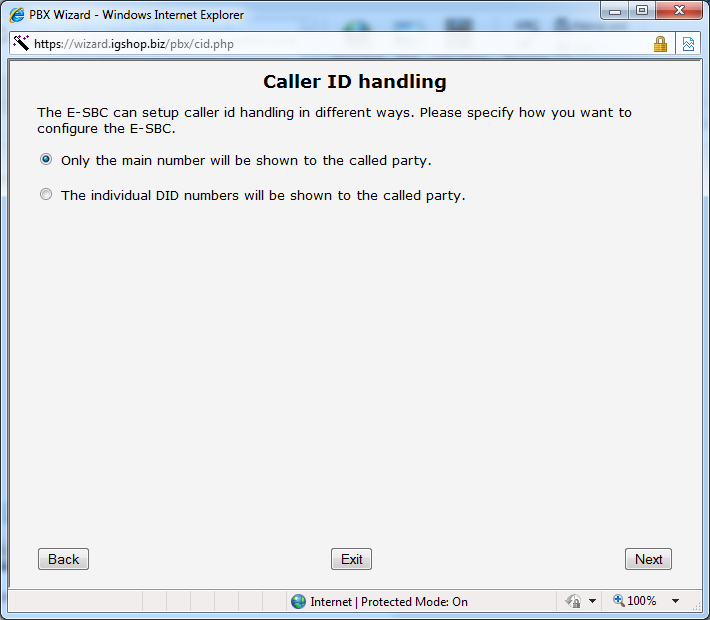 I will start with showing you where you can find the Organizational settings in ECP. 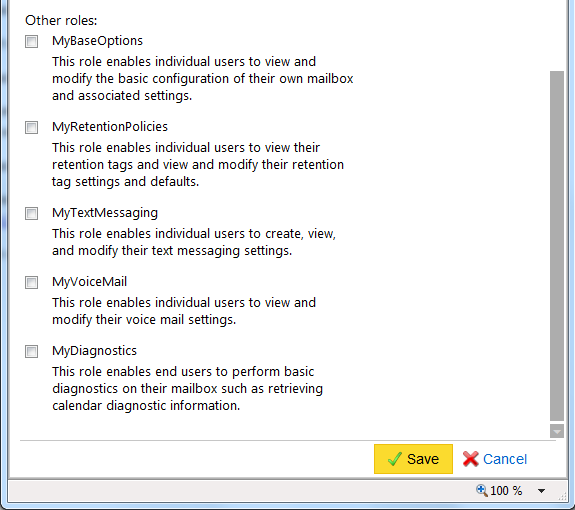 In Outlook Web App choose Options and then See All Options. 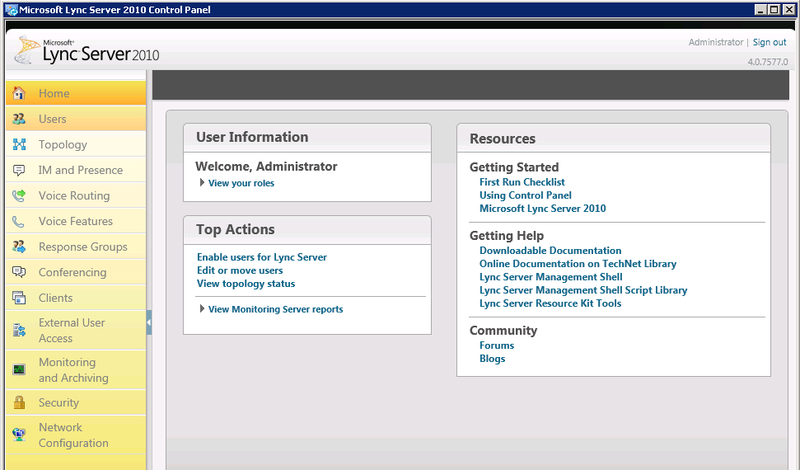 In ECP, click on Manage Myself and choose My Organization. To view the Role Groups click on Roles & Auditing. 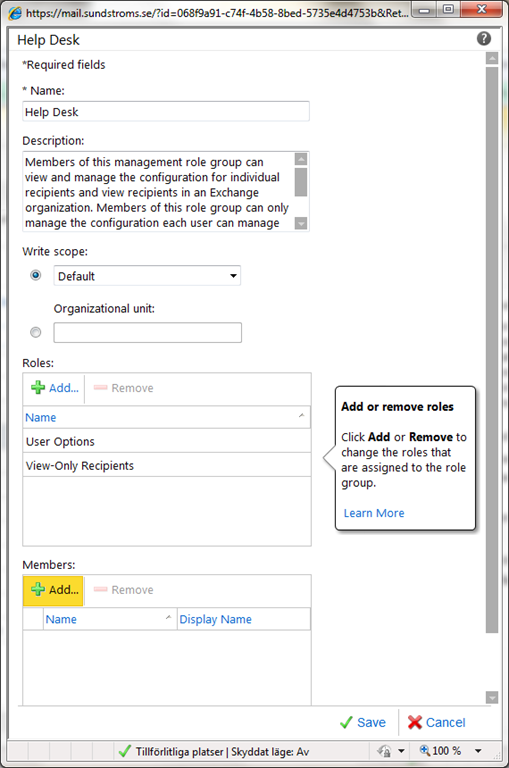 In the work pane you will see a list of all Role Groups including Help Desk that we are looking for. 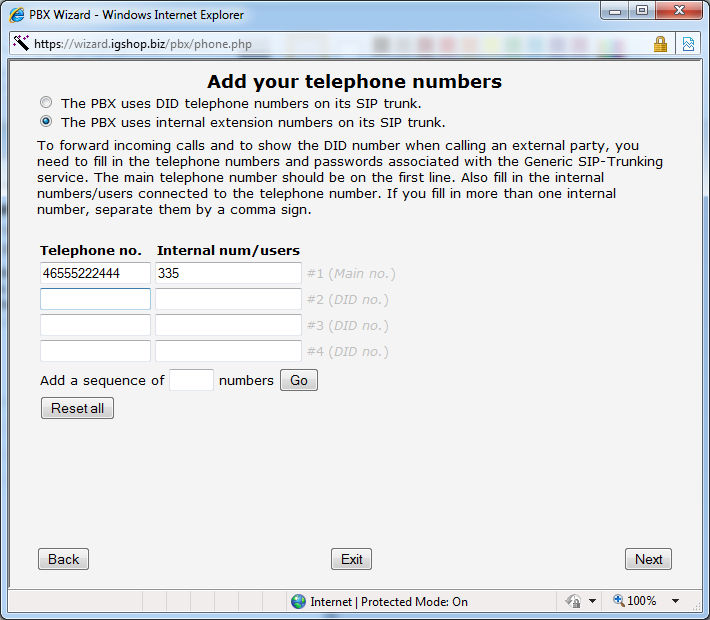 Double-click Help Desk or select Help Desk and click Details to open the details window. To add a new member to the Role Group, click Add in the Members section. 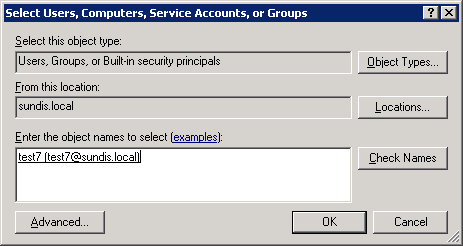 Select the users, USGs, or other role groups you want to add to the role group, and then click OK. It is strongly recommended to use the built-in Role Groups as far as possible and only add own Role Groups if it is absolutely necessary. Next we will create two new role groups, on with a custom scope and one with a OU scope. For this example we will use the ECP to create the new role group. 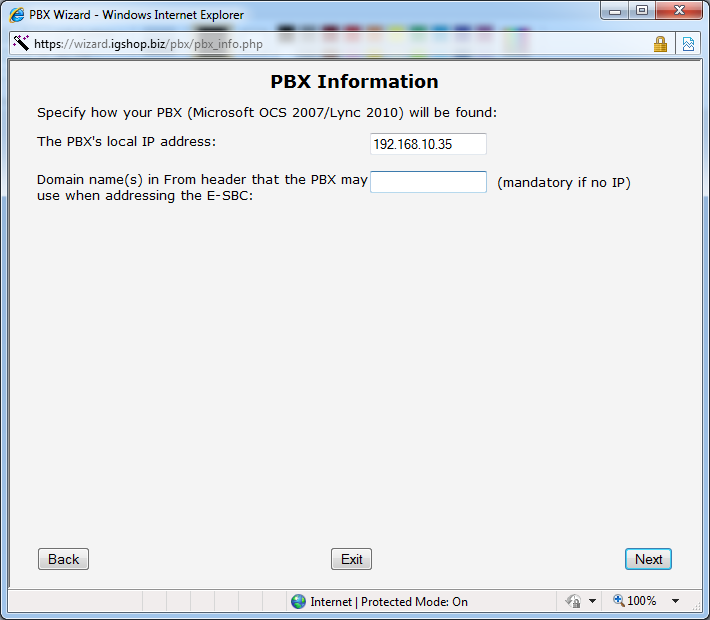 I will not explain the initial steps for ECP, you can find more information on that under Scenario 1 – Example 2. Before we can create the group we will have to create the custom scope. This can only be done using EMS. 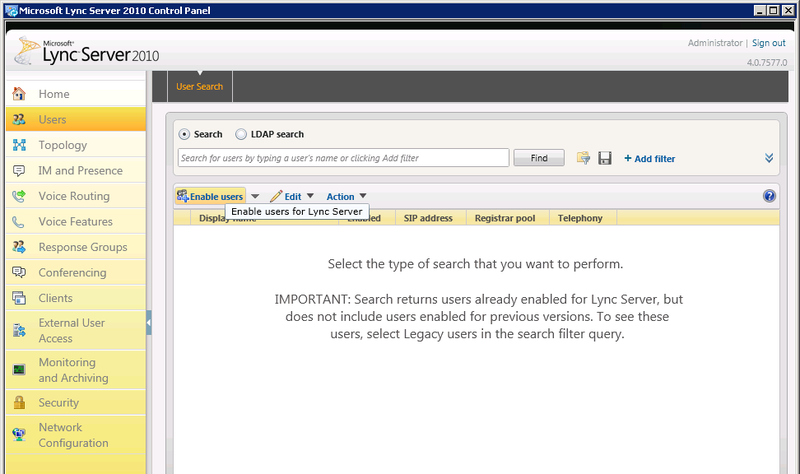 In the following example we will create a scope with a filter to include all users in the department Sales. When we have the management scope in place we can move on to create the role group. 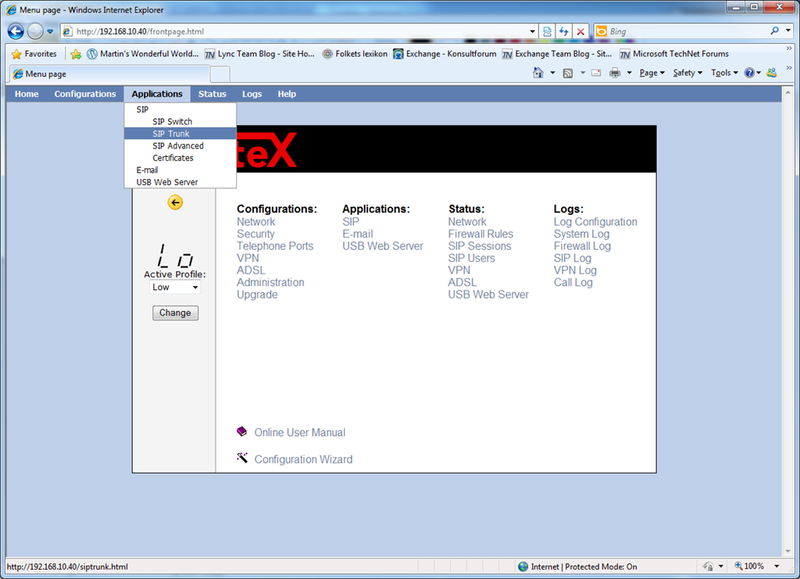 Navigate to the Administrator Roles tab, Role Groups, click New. 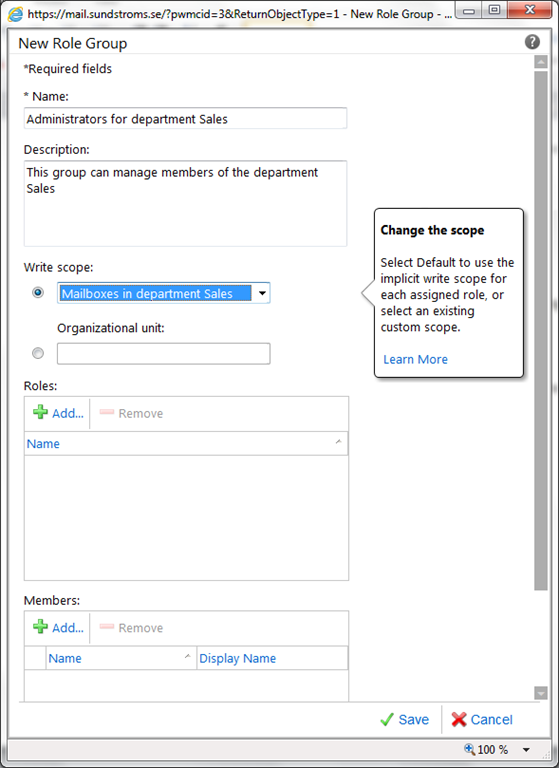 Enter a name and description for the new role group and for Write Scope choose our newly created management scope Mailboxes in department Sales. 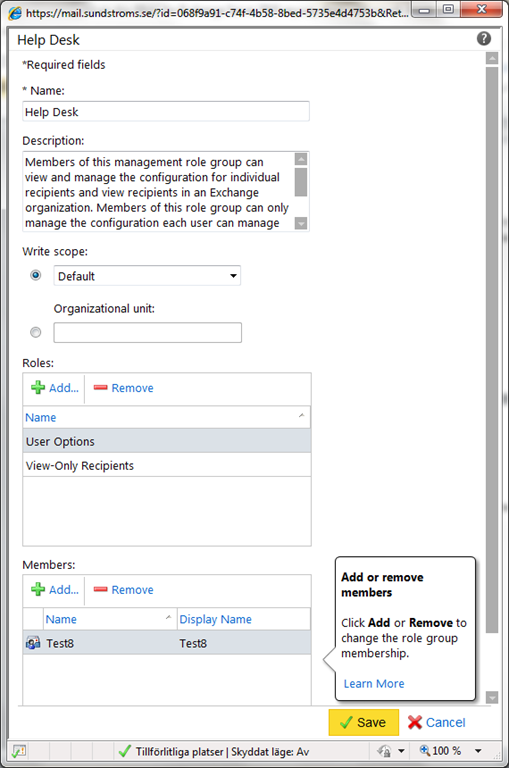 To add a management role for the role group click Add under Roles. In the new window add the roles by selecting them ad click add, click Ok when finished. To add members to this role group click Add under Members. In the new windows add the groups and mailboxes by selecting them and click add, click Ok when finished. Review the settings and click Ok when finished. 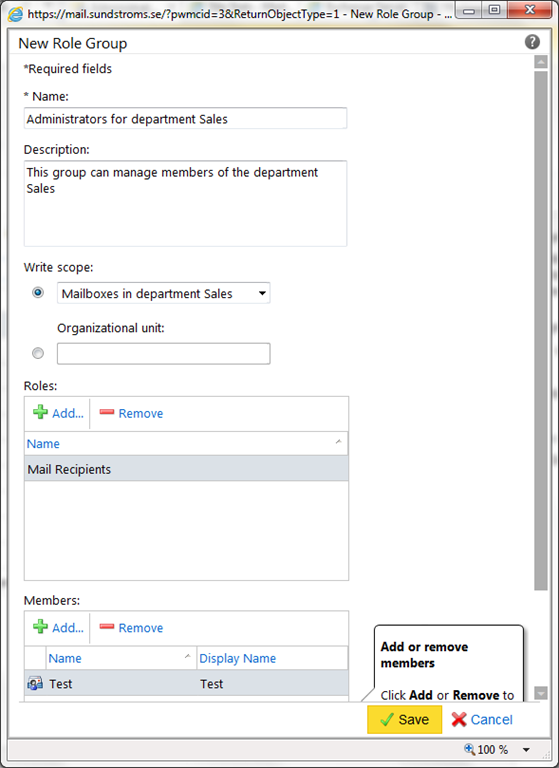 In this example we created a new role group that affects all mailboxes in the department Sales. 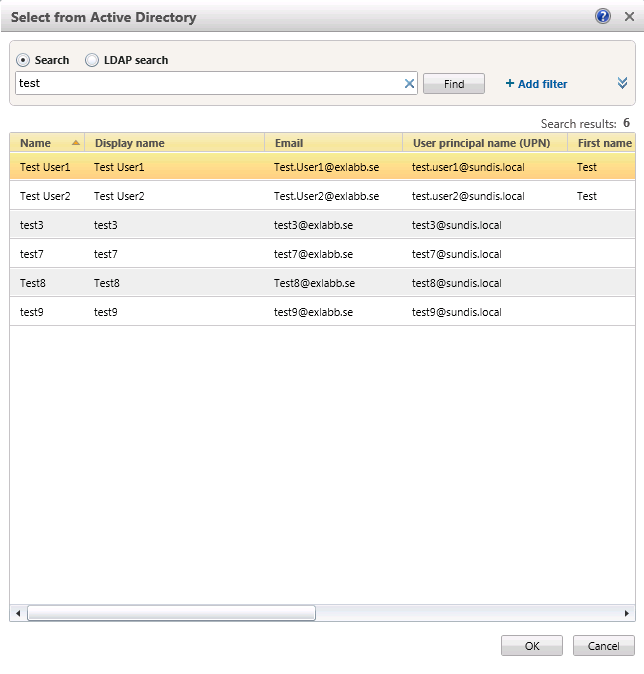 We added the user Test and the management roles Mailbox Recipients which enables the user to manage existing mailboxes, mail users, and mail contacts. New-RoleGroup -Name "Mailboxes in OU IT Support" -Roles "Mail Recipients" -RecipientOrganizationalUnitScope "IT Support"
There will probably be a time where you would want to remove a role group for some reason. 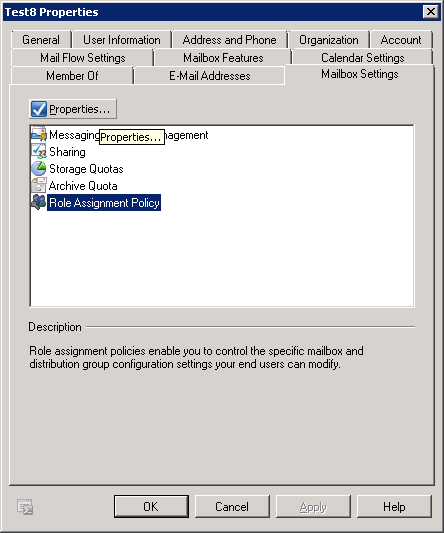 Remove-RoleGroup "Mailboxes in OU IT Support"
In this scenario we will create a new assignment policy and add a role to the policy to enable users to manage information related to their own mailboxes. 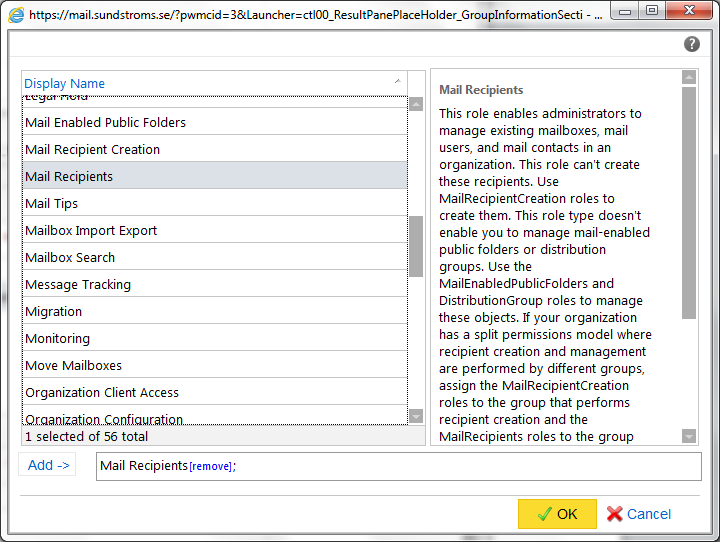 First we will create a new assignment policy, in Outlook Web App choose Options and then See All Options. 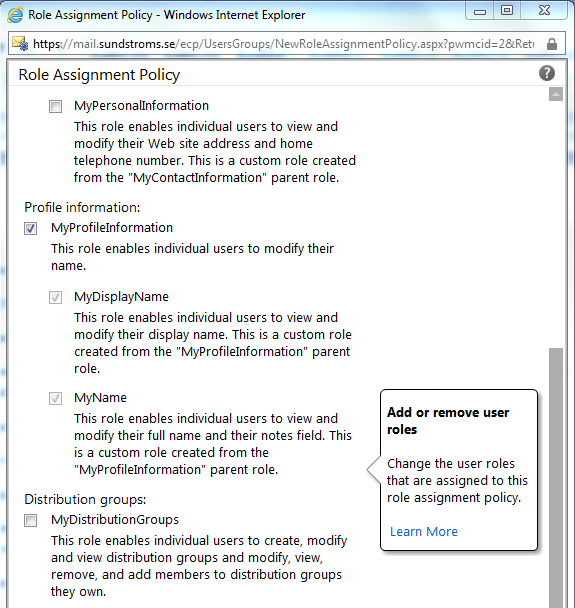 To view the Assignment Policies click on Roles & Auditing and then User Roles. 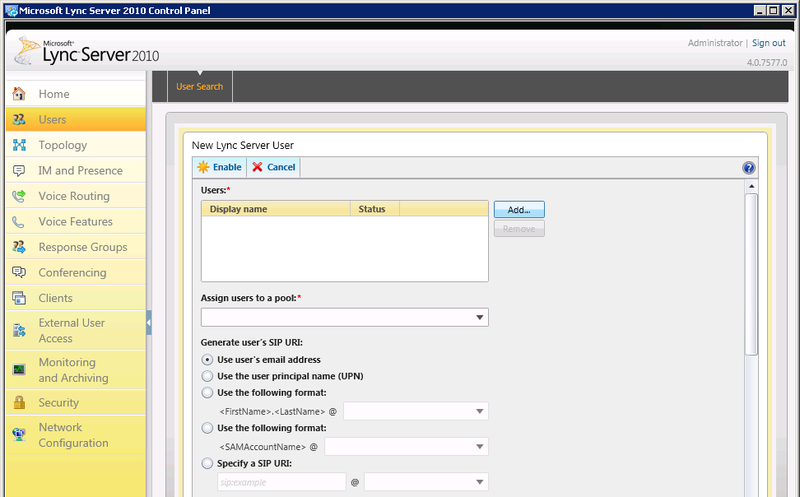 Click on New to start creating a new policy. 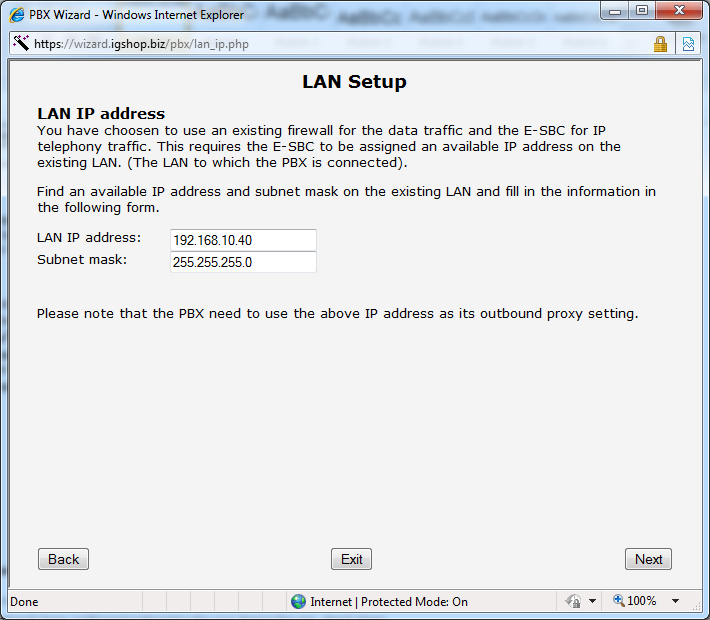 Start with entering a name for the assignment policy, Profile information for my example. We are going to add roles to control Profile information for the user. Check MyProfileInformation, this will also check the roles MyDisplayName and MyName. 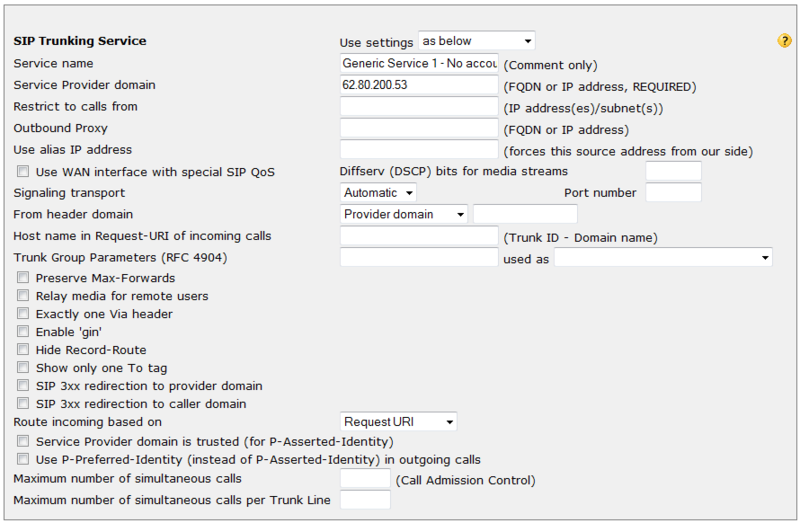 Also make sure that you check MyBaseOptions, this enables the users to use ECP. Click on Save to create the assignment policy. The next step in this scenario is to change the assignment policy on a mailbox. 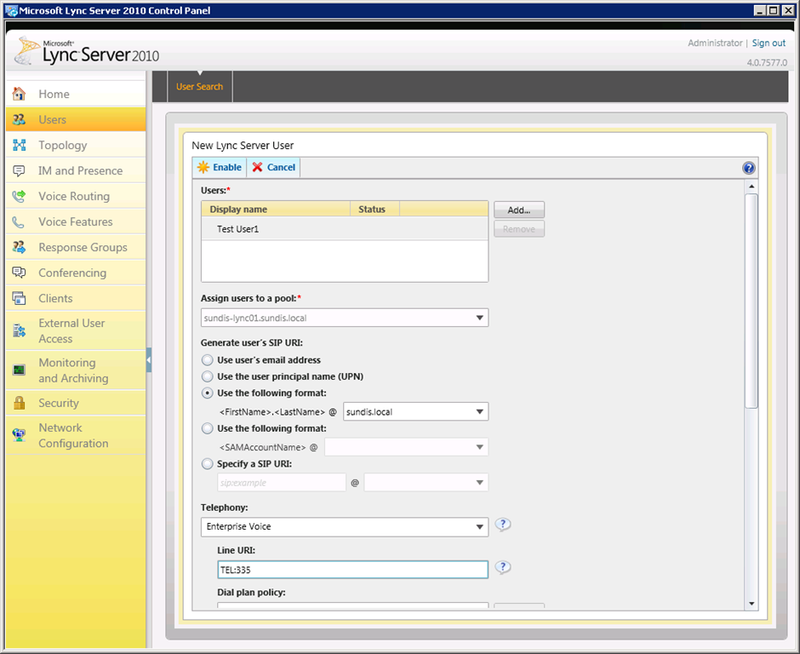 Open EMC and navigate to Recipient Configuration and Mailbox. Right click on the mailbox you want to change and choose properties. 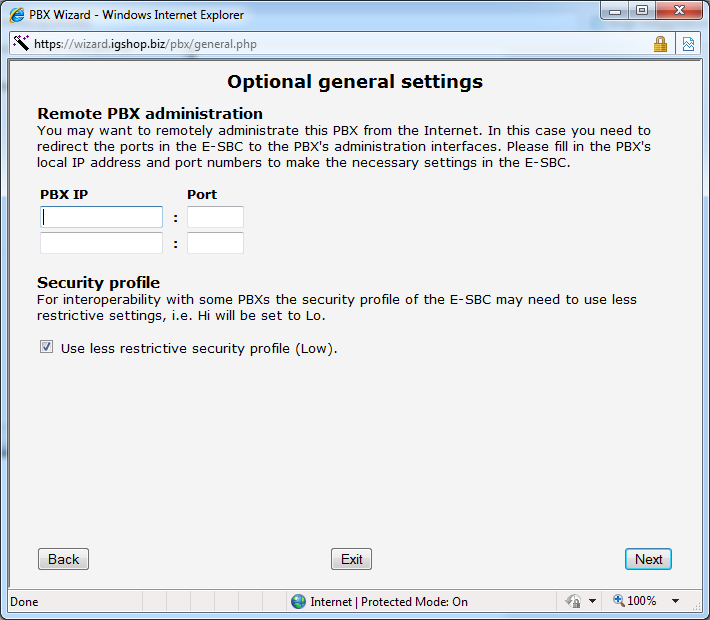 Click on the tab Mailbox Settings, select Role Assignment Policy and click properties. 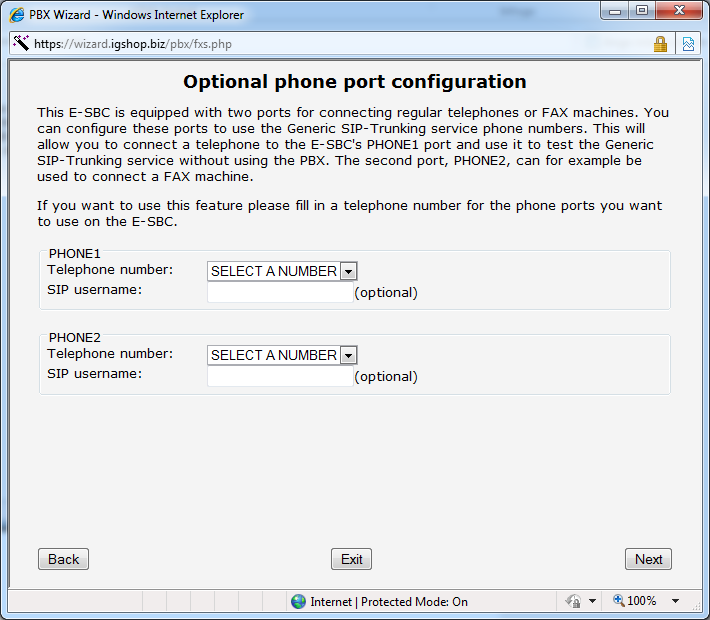 Click on Browse, this opens a new dialog window. 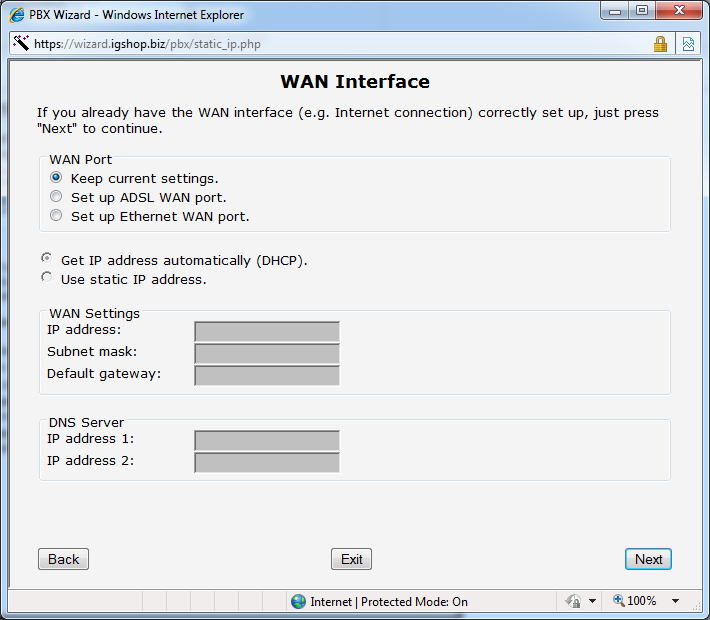 Select the Assignment Policy you want to change to and then click Ok. 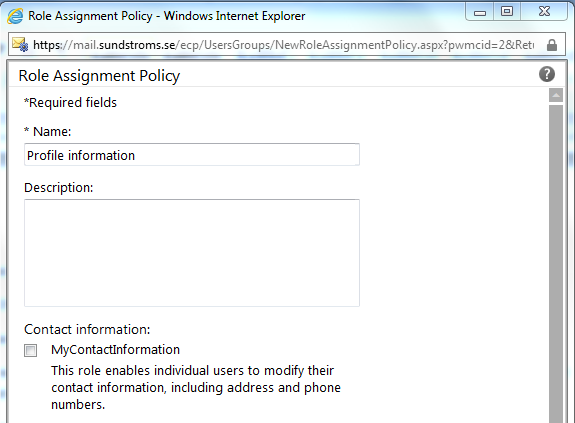 Check that the correct Assignment Policy is listed and then click Ok.
Click Ok to close the mailbox properties window. You now have the correct Assignment Policy applied on the mailbox and this should have immediate effect on the mailbox. That is all for this time, I hope that you find the examples useful and if you have any ideas on other examples you would like me to include in this post just let me know. And as usual, if you find any errors or have any further questions do not hesitate to post a comment. Thanks for reading! Part 3 in this series can be found here!